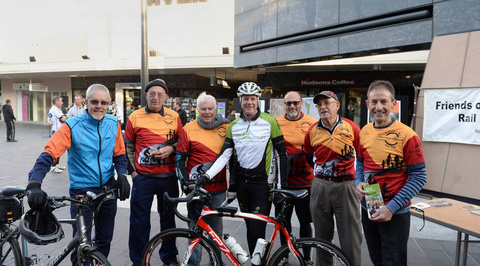 Bendigo was one venue for the 2014 national Ride2Work event on October 15th. With the assistance of the City of Greater Bendigo, the day provided support and opportunities to encourage more people to regularly commute to work by bike. The event showed many people that the ride could be done, with no car parking issues, and the morning’s ride was not such daunting exercise! With a BBQ breakfast provided in the Hargreaves Mall, plus a mini cycling expo, much discussion revolved around bikes, and the morning ride rather than work matters! Of course there was also the opportunity in the Hargreaves Mall to see and hear about Friends of the Bendigo-Kilmore Rail Trail group’s activities, as well as the progress of the O’Keefe Rail Trail’s current extension between Axedale and Heathcote.